Now for Rea­son Num­ber One that this is a good week for this series: After the sec­ond book in the series, The Wrong Girl, won the Agatha for Best Con­tem­po­rary Nov­el of 2013, the third, Truth Be Told, is up for an Agatha this year as Best Con­tem­po­rary Nov­el of 2014! And—Ta Da, Rea­son Num­ber Two that this is a good week to show­case The Oth­er Woman—Click here for a Goodreads give­away going on for this book right now. It’s mighty rare when one’s work is rec­og­nized so beau­ti­ful­ly, and on the same day when I want to remind read­ers that my Goodreads give­away is wind­ing down. The next time you see an old­er woman who looks like she lives on the streets, remem­ber to be nice, she might just be more than she seems. 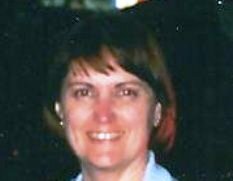 She could be ama­teur sleuth, Jo Durbin, and, if you’ve done any­thing bad, she might be look­ing for you. Tal­ent­ed author Nor­ma Huss has craft­ed a fun read that offers a dif­fer­ent kind of sleuth with a very dif­fer­ent back­ground. Life on the streets is a hard way to live and any read­er will def­i­nite­ly won­der how such a per­son, par­tic­u­lar­ly a woman, could have the ener­gy and ambi­tion to inves­ti­gate mur­ders or oth­er crimes. Join Jo, and her some­time side­kick Sylvie who is also her sis­ter, in track­ing down a killer after she dis­cov­ers a body in a clos­et with the help of her cat, Clyde, who isn’t all there. I’m pleased to rec­om­mend Yesterday’s Body as a sto­ry any mys­tery fan will enjoy. The char­ac­ters’ var­ied back­grounds blend into a sto­ry you won’t want to put down until you find out who the killer is and why they kill. You’ll enjoy meet­ing the real­is­tic char­ac­ters as they cross paths with Jo and your­self. You’ll find you’ve joined Jo in her inves­ti­ga­tion with Clyde and Sylvie and their three­some has become a four­some intent on solv­ing the crimes. Enjoy the adven­ture. I sure did. Now for the Goodreads give­away information—ends April 9, 2015. Giv­ing away ten copies. Sign up here. 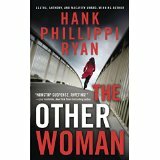 Next Mon­day, my five-star review (of other’s books) will be back. And this Thurs­day I’ll have some­thing for both read­ers and writ­ers. I’m sub­sti­tut­ing a bit of news for my usu­al five-star review today. 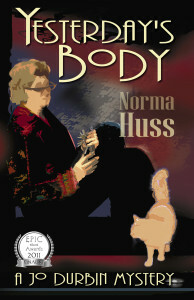 I’m run­ning a Goodreads give­away with Yesterday’s Body, my first pub­lished mys­tery. The event runs from March 17, through April 9, and I’m giv­ing away ten copies. Goodreads give­away link here. For a brief descrip­tion: Jo Durbin isn’t under 40 or anorex­ic slim. Her face wouldn’t launch a thou­sand ships or even a row­boat. She won­ders, how did she get the job with those beau­ti­ful peo­ple? And, will the police find her fin­ger­prints on the mur­der weapon? Did one of those beau­ti­ful peo­ple she works with kill Francine? Or, will they point to Jo? Hard to explain that she’s only try­ing to revi­tal­ize a career gone south. Her plan—write a best-sell­er as a bag lady liv­ing on the street. Invent an imag­i­nary cat to fur­ther her image. Col­lect keys that let her into unused stor­age and vacant homes. Get accept­ed by the street peo­ple. Befriend the guy who wants to “save” them all. It seems pos­si­ble. Ignore the carp­ing sis­ter who “knows bet­ter”? That one’s tricky. Elude the killer long enough to solve the crime? You know that’s the killer ques­tion. “I very much like your voice. You project just the tone and atti­tude I love to read.” Chris Roer­den, Author of Agatha Award-win­ning DON’T MURDER YOUR MYSTERY. The first edi­tion e-book was a 2011 EPIC final­ist for mystery/suspense. The sequel, For­got­ten Body, will be pub­lished lat­er this year. 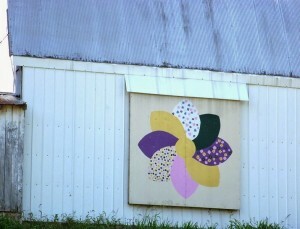 I’m vis­it­ing Killer Crafts and Crafty Killers blog today with a repeat post about barn quilts. How do you like the new barn pic­ture she found to show? See the whole sto­ry here. My ebook, A Knuck­le­head in 1920s Alas­ka is still free through March 2, 2015. It is avail­able for Kin­dle at Ama­zon. Every Thurs­day I post some­thing I find inter­est­ing, hop­ing you will too. So, today’s inter­est­ing bit is about tomorrow—which is when one of my e-books goes free for five days. File it under both his­to­ry and mys­tery. The his­to­ry part is easy. The book is one I wrote with my father from audio tapes he gave me quite a few years ago about going to Alas­ka to earn col­lege mon­ey. He was nine­teen, a hot-head­ed kid who didn’t want to take any guff. Of course, guff is often what one gets from an employ­er, so he had a lot of dif­fer­ent jobs. He failed to blow him­self up car­ry­ing dyna­mite. He failed to drown when he and a horse end­ed up under the ice in a near-freez­ing riv­er. He even man­aged to sur­vive danc­ing with what they referred to as “a woman on the line” when her boyfriend showed up. In fact, after I heard my father’s adven­tures, I real­ized that it’s a mar­vel I was ever born. That’s the his­to­ry part. The mys­tery part is at the tail end of this book, sort of a Thank You for reading—a reprint of my first short mys­tery, “Yesterday’s News” pub­lished in Future’s Mys­te­ri­ous Mys­tery Mag­a­zine sev­er­al years ago. 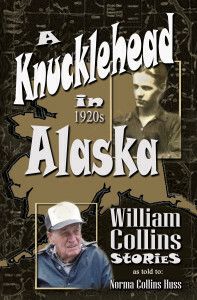 A Knuck­le­head in 1920s Alas­ka e-book is avail­able for Kin­dle. The free dates are Feb­ru­ary 27 through March 3, 2015. Do read and enjoy! Mon­day, I’ll be back here, but I’ll be vis­it­ing Killer Crafts and Crafty Killers too. Thank you so much for being part of the release par­ty and give­away for the sixth book in my Guardian Witch series! A month after their bond­ing, Ari and Andreas are still adjust­ing to mar­ried life when they learn the hard way that the O-Sev­en, the ter­ri­fy­ing and bru­tal vam­pire elders, still have them in their sights. A three mil­lion dol­lar boun­ty hangs over each of their heads, and there’s no lack of assas­sins eager to col­lect. When the local seer has a ter­ri­fy­ing vision of the destruc­tion of Riverdale, it’s up to Ari—as usual—to keep every­one safe. Only this time, an ene­my from the past has bound her fire pow­ers, and the city’s string of arsons seems con­nect­ed. Awak­en­ing the Fire (#1); Fire With­in (#2; Burn­ing Both Ends (#3); Blood and Fire (#4); Fire Storm (#5). Blog Tour GIVEAWAY: Nov. 7–10: Read­ers and writ­ers always talk about char­ac­ters in books, but set­tings are almost as impor­tant, and they play a huge role in the Guardian Witch series. 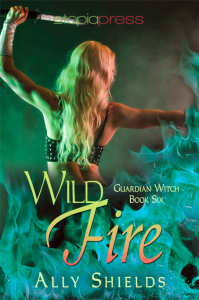 Wild Fire is no excep­tion, and this blog tour is reveal­ing sev­er­al set­tings that are the back­drop for major events in this new release. In fact, I think they’re so impor­tant that I’m run­ning a spe­cial con­test. If you col­lect the names and num­bers of all ten set­tings, you could win your choice of three ebooks in the series (includ­ing this lat­est release) or a $15.00 Ama­zon gift cer­tifi­cate. It’s easy to do. Here are the rules. Vis­it the blogs on this list — or enough to col­lect all ten set­tings — then email me at allyshieldsbooks@gmail.com by 9:00 a.m. EST, Mon­day, Novem­ber 10, 2014 with your com­plet­ed list. You will auto­mat­i­cal­ly be entered in the ran­dom draw­ing (two win­ners). NOTE: A set­ting may appear on more than one blog, so be sure you have 10 dif­fer­ent set­tings before turn­ing in your entry. 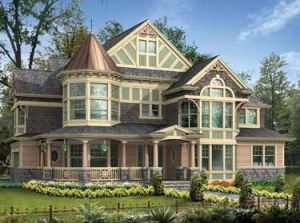 Set­ting #10: Vic­to­ri­an Man­sion — Andreas’s Vic­to­ri­an home in Olde Town, which Ari now shares. The well-pre­served res­i­dence and its spa­cious lawn is sur­round­ed by a six foot wrought iron fence and par­tial­ly lined with well-kept shrub­bery. It is fur­nished pri­mar­i­ly with antiques from the 1700s and 1800s. Is there any­thing bet­ter than a ghost sto­ry for Hal­loween? Yes—two ghost sto­ries. One is mine, but first, let me tell you about Vala Kaye’s Ghost Writer. Tech-savvy teen Malden Mont­gomery leaves New York City antic­i­pat­ing noth­ing but bore­dom when her artist-moth­er brings her along on a two-week vaca­tion to a fam­i­ly inn in rur­al Vir­ginia. What Malden doesn’t expect is the owner’s 17-year-old son, Jack­son, who is total­ly to-die-for cute. But does she dare believe him when he tells her that her room at the inn may be haunt­ed by a young woman named Emi­ly, who died there more than 150 years ago? Then Emi­ly begins to com­mu­ni­cate with Malden and she and Jack­son real­ize they have to find a way to help Emily’s ghost come back home or risk a spirit’s wrath if they choose to leave her lost in the dark­ness for­ev­er. Vala Kaye grew up in Texas as an avid read­er of sci­ence fic­tion, romance and his­to­ry. Her favorite writ­ers ran the gamut from Robert Hein­lein to Mar­garet Mitchell, and includ­ed side jour­neys with Louisa May Alcott’s “Lit­tle Women” and The Hardy Boys mys­ter­ies. After grad­u­at­ing from col­lege with a dou­ble major in Com­mu­ni­ca­tions and His­to­ry, Vala now lives and writes in warm and sun­ny south­ern Cal­i­for­nia. She is addict­ed to movies, live the­ater, word games and sal­sa danc­ing. In her first pub­lished YA novel­la, Ghost Writer, Vala explores what hap­pens when the human ‘spir­it’ meets com­put­er tech­nol­o­gy. Vala’s newest title is Arti­fi­cial Intel­li­gence, book #1 of “The Super­hero Next Door” series. The sec­ond YA ghost read is mine, Cher­ish (A YA Ghost Mys­tery). You can read all about it here: The e-book is free for five days from Octo­ber 28 through Novem­ber 1 at Ama­zon. But, before you do any­thing, com­ment below. Maybe you will win Ghost Writer. Sign up for the give­away here. Read the first two chap­ters here. It’s the sopho­more Local His­to­ry ceme­tery vis­it. 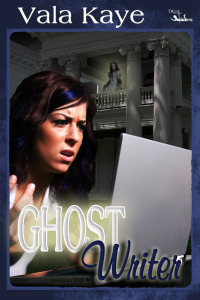 Sure, it’s almost Hal­loween, but Kay­la has seen that teen-age ghost for years. Why won’t she leave? When the dreamy senior asks Kay­la for a date, she decides to prove to her­self that she’s mature and in charge. She’ll tell that ghost to go away. But Kay­la shouldn’t have touched the ghost’s cold hand, because that’s when every­thing changed. Sud­den­ly, it’s 1946, or is Kay­la dream­ing? Is she crazy? Why is her name Cher­ish? Why is her moth­er at home bak­ing cook­ies when she should be at work? And, she has a father? Didn’t he die years ago? Why is her best friend Trudy instead of Dani? And the thing in her pock­et is not a com­pact with a bad mir­ror. DON’T TRY TO OPEN IT! Text mes­sages do trav­el across the years, judg­ing from those on her cell phone. But why is Dani mad at her? She isn’t there, is she? It can’t be, but it must. Some­one is tak­ing Kayla’s place in the twen­ty-first cen­tu­ry. Who? Fact: Cher­ish is ruin­ing her life in two cen­turies. 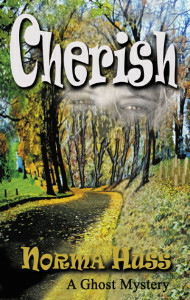 If Kay­la doesn’t find her way home to her own time and her own body, she will die in 1946 with Cher­ish.